Well I see a lot of quotes and stuff against Christianity pretty much everywhere on internet. and rude jokes (which are really funny) about bible and stuff. 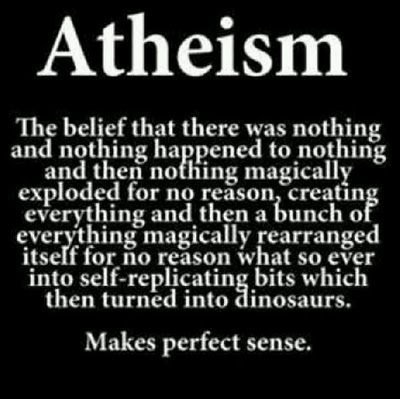 Here's one on Atheism for a change. so this makes perfect sense ? "God is omniscient and omnipotent. The individual soul has limited powers. Due to Maya, he is in ignorance and attached to the sense objects of the world. Both God and the souls are eternal. Apart from these two there is a third eternal existence: Maya. God is supreme. He enlivens Maya through His grace, and with this inspiration, Maya creates this universe. God is not the direct creator of this world. (From Hindu Vedas)"
Yes it at least makes a lil sense..
Wow, the education system really failed you. Even then, several times things that have happened in the future have affected the past, ''sometimes reaction comes before action''. The universe could be an example off this, considering it is widely believed that the universe expands at a faster rate than light, that also means it could have traveled back in time eternally and therefor already having expanded for an infinity before it's own creation and therefor made itself. If you disbelieve in God you will believe in anything like matter and energy always existed. Again its some form of childish nonsense. Then it says, "and then god said let there be light"... that would imply the sun was created after the earth... when we now know the earth was in fact, after the sun. Then it says, "and god created the two lights, the greater light to rule the day, the lesser to rule the night." This means that both the sun and the moon emit light... because at the time that was the belief. When now we know the moon simply reflects light from the sun... Secondly it says that the sun is separate and above that of the other stars, when we now know that the sun is just another star, and on the contrary to that statement, not even close to the biggest or the brightest. ... The first page... three fallacies... enough to completely discredit the entire scientific value of the book. So... You are telling me... that i am childish... yet you believe in a book that now only tells you that the moon and the sun both emit light... that the earth and the universe were created at the same time... that the sun was created after the earth... and that as long as your slave gets back up after a day or two... you can beat them as much as you want... because they are your property... So... Tell me again what your slave thinks about your religion as he lies on the ground at death's door only for you to patch him up enough for him to live so you got to heaven? If your religion does end up being true... id rather go to hell with the men who got punished for their slave dying than act like saints with men who patched their slaves up enough for them to live. i find Atheists hilarious..like watching my dog barking at the moon then chasing it's tail...lolz.. I find theists to be good people until they try forcing their religion on me. So nice! Your reaction to christian hate... More hate! Wipes my teary eyes plays violin music...boohoo hoodoo make fun of an atheist and they cry to mommy. ������ ������ ������ �������� ������ �������� ��������, ���� ���������� ���� �� ������ ���� ��*�������� ���� ���� ������! That's great, I'm using that! Dumb god loving mugs think there's a supernatural being! BWAHAHAHAHAA! 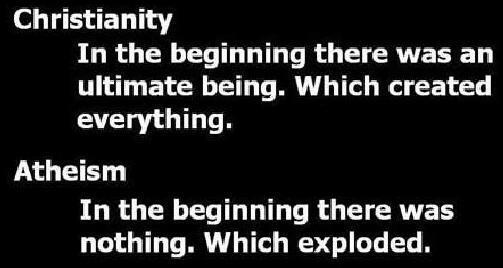 Exploding planets is a he'll of a lot more convincing than some hippy with a beard in the sky! When will people evolve? why cant you ALL agree that an "ultimate being" is phisically IMPOSSIBLE, if there was no evolution, then why don't fish have guns and if you write quotes about anti-Atheism, you nor an anti Cristian is correct. MY opinion is that life is an illusion, the universe is a hoogram, everyone's going to die so I'm going to watch TV now. clear? good, I'm sick of both Christians and anti-Christians. Thing is we don't think that there was nothing and then it somehow exploded. We think that all the mass in the galaxy was being held together in a very small and dense point called the initial singularity. It “exploded” and started expanding after some weird complicated science stuff. There is more, and this is why uneducated people think it makes no sense. Specifically some theists. That's not what atheism is. Atheism is the lack of belief in any god or gods. That's it.